Lucid Dreams is the final team game project (Capstone) for Sykotik Entertainment in C18. As a Level Designer on this team, I assumed responsibility over level creation, story development and overall level design in conjunction with implementation of design mechanics created by the Lead Level Designer and Game Designer. I participated in Scrum and Design meetings to flesh out design concepts, and also created scripts and processes to assist in the smooth creation of levels and events. Lucid Dreams is a stand-alone, Singleplayer game designed from the ground up with the theme of "lucid dreaming". Lucid dreaming is the concept of being in a dream, but being self-aware and in a "waking state". The concept stemmed from the team's desire to create an artistic game, with a deep surreal element. Lucid Dreams started off as a game focused on story creation, with a secondary emphasis on gameplay. The first challenge came from the story creation, in which I took on the role as Story Designer. With that context, I was originally assigned as a Level Designer and Story Designer, in charge with coming up with the story and context of the game. 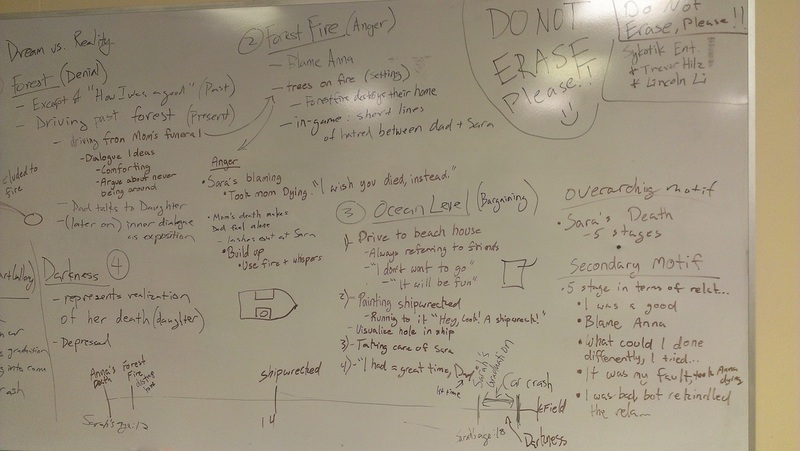 Provide a deep and sensible story that would "give all the feels"
Below is an example of our white-board process of Story Design. An original picture from the development process. As seen above, various themes involved around our different levels, but were inspired by the "5 Stages of Grief", taking place within the Lucid Dreams of our main character, James. About 75% into the development cycle, my role shifted back to being a standard Level Designer, in charge of creating levels for the new gameplay focused "Lucid Dreams". Our mechanics involved allowing players to walking toward walls and rotating the entire environment 90 degrees by being able to walk up the side of environments. However, one of the issues with the new levels, was that while all the other Level Designers were assigned to different levels, no one had promoted or pitched the idea of a tutorial / introduction level that would teach players the mechanics. I volunteered to take on that role, and created a prototype / pitch for the level. As one of the few developers within the team that had some prior experience as a Lighter, due to my 3D Animation education from Purdue University, I was tasked with working with the Art Team to create the lighting feel of the new "Lucid Dreams". One of the biggest challenges was just knowing where to begin, as Lighting and being an Artist was not my natural development role. On-top of creating the tutorial / introduction level, I had to balance my work as both an Artist and Designer. The below banner is a link to examples of my lighting work, that translated to Lucid Dreams look and feel.